Opting for a visa on arrival is often the cheapest option. Australian visitors are eligible for a multiple entry visa which is valid for 90 days and must be purchased in cash, with US dollars for about E£455 (AU$35). If you’d rather apply before you arrive, for your own peace of mind, you can do so online via Visalink – Inspiring Vacations customers receive a 35% discount. There is a common culture of baksheesh or tipping in Egypt. Much of it is similar to other countries where, for example, service industry workers may expect a tip for taking your bags to your hotel room. You are also expected to tip taxi drivers although Uber can be used to secure a more competitive fare. Other gratuities are more particular to Egypt: tipping a policeman who helps you cross the road or tipping the owner of a camel you wish to photograph next to a pyramid. To be fair, the latter is hard to replicate anywhere else. Part of Egypt’s tipping culture is a near-constant negotiation over the prices of goods and services. Haggling can feel awkward if you’re not used to it, but the locals are typically friendly and are unlikely to take offence if you decide to walk away. The way to do this respectfully – or, to decline to engage in any negotiation especially if you’re just browsing – is to place your right hand on your chest and shake your head. It is a gesture that thanks the vendor but conveys that you’re not interested in buying. In Egypt, the left hand is commonly used for removing clothing and sanitation, so to offer it to another person is considered rude. Use your right hand when handing or receiving money or goods to avoid any potential embarrassment or offence. Even in establishments where prices are set and you receive a bill for goods, be prepared to pay a service charge and the equivalent of a sales tax. This is most common in restaurants and hotels, where prices can increase by as much as 25%. Visitors are not required to pay a departure tax as this charge is covered in your plane ticket. While certain aspects of Egyptian culture can catch visitors off-guard, a good way to prepare yourself and navigate any uncertainty is to learn some key phrases in Arabic, the local language. English is spoken widely throughout Egypt – particularly at tourist attractions, hotels and airports – but knowing the popular Egyptian-Arabic forms of “hello” (as-salām 'alaykum), “thank you” (shukrān) and practical questions such as asking directions to the restrooms (el-ḥammām fain?) can set your mind at ease and show locals that have an interest in their country and culture. 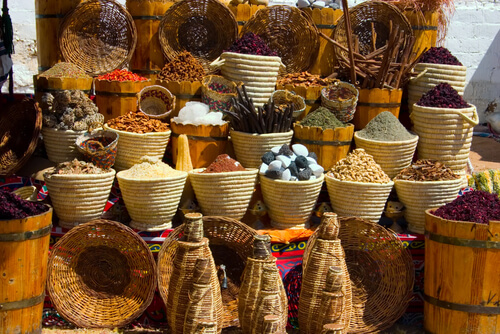 From five-star restaurants to freshly made street food, Egypt has a lot of culinary options. It’s all competitively priced and nourishing. Check out where locals eat as this is usually the best indication of where to find food that’s authentic and delicious. Street food is considered safe to eat if you can peel it, or if it’s served hot. In Egypt, do not put food in your mouth with your left hand or, pass food to someone else with that hand – it is considered unhygienic. Your waiter will also require a tip that is separate to the restaurant service charge and sales tax. Like other Muslim countries, Egyptian culture necessitates that both men and women show little bare skin. For women, this means covering their shoulders and knees, particularly when visiting rural locations and religious sites. Female travellers can also cover their hair and heads, which is advisable to shield against the heat. Solo female travellers will, unfortunately, receive more attention from male locals but this can be minimised by both dressing conservatively and touring as part of a group, or with a tour guide. Men can wear shorts and short sleeves, but during the evenings are also advised to cover their legs and their arms. While tap water in Egypt is considered safe for showering and brushing your teeth, it contains high levels of chlorination and isn’t advised for drinking. The safest option is to drink bottled water which is widely available but always check that the seal is intact. A local refreshment which is a real favourite is the carbonated malt drink Fayrouz, which comes in varieties such as pear and pineapple. Egypt’s Muslim culture extends to the public holidays it observes. During Ramadan – the ninth month of the Islamic Calendar, usually April or May – there are local customs that extend to international visitors. These include abstaining from eating, drinking, smoking or chewing gum from sunrise to sunset. While these do not create ideal conditions for non-Muslim tourists, it is a chance to see another side of the country, particularly when restaurants reopen for celebratory feasts after the sun has set.